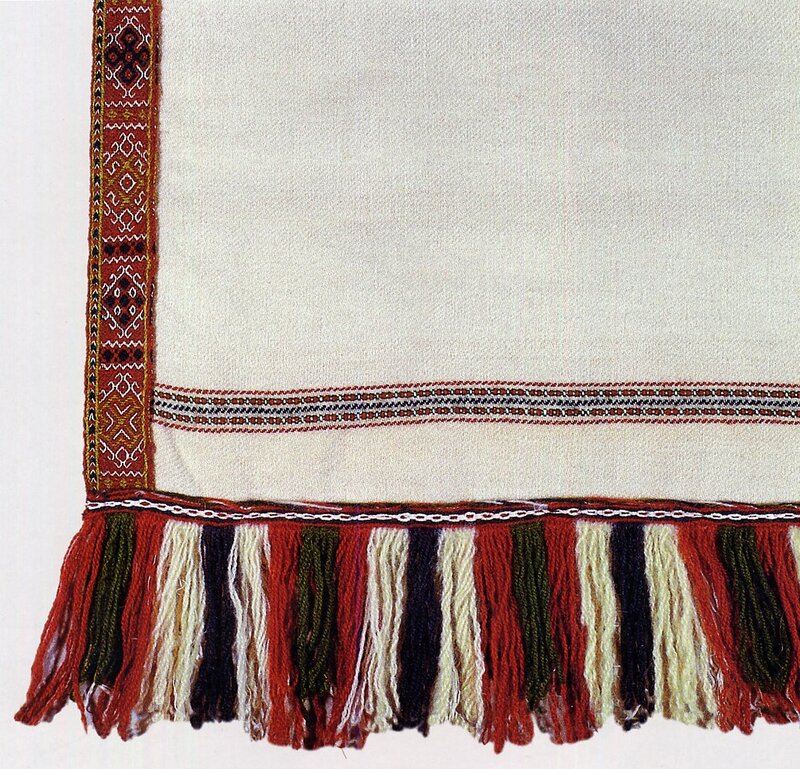 Today I am continueing the series on Latvia, I will look at the costume of the Province of Zemgale [Semigalia]. The Semigalians, one of the Baltic tribes, are renowned for their stong resistance to the invasion of their lands by the German Teutonic Knights in the 13th cent. They form the bulk of the populatin in the present day Province of Semigalia [Zemgale], along with a certain admixture of the Votes, a small Finnic people from Ingria in present day Russia. 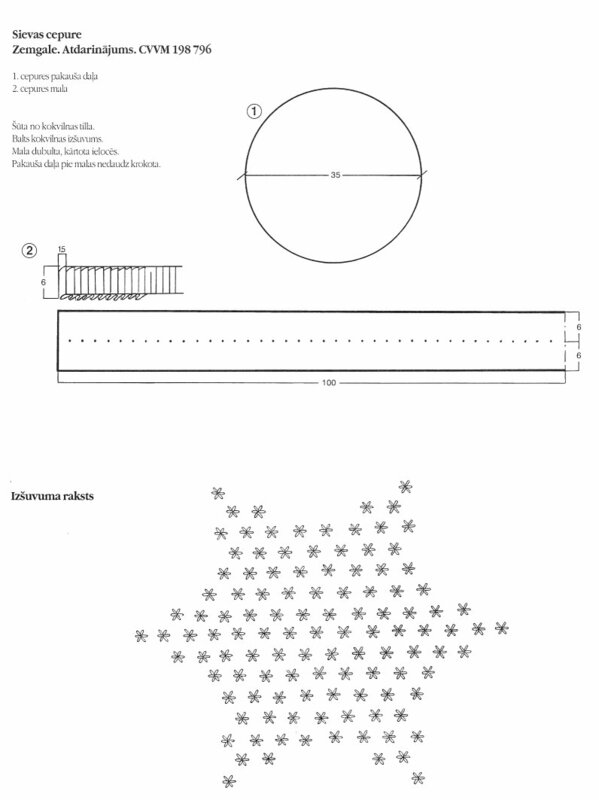 Here is a short article about the Semigalians, a more general article on the history of the Latvian ethnic groups and a map of the area at the time. And here is a map of the present day Provinces of Latvia. You can see that most of them are named after one of the old Tribes. 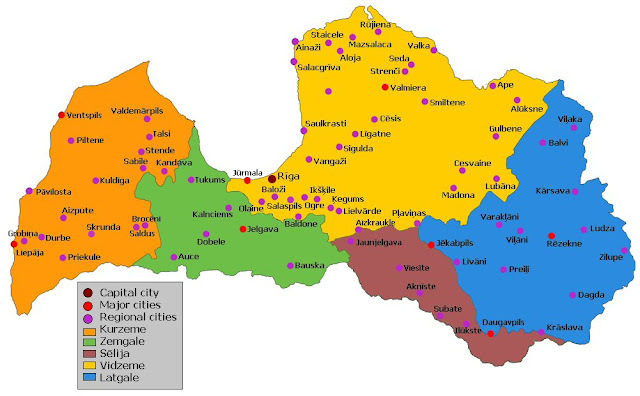 Zemgale [Semigalia] is shown in green. 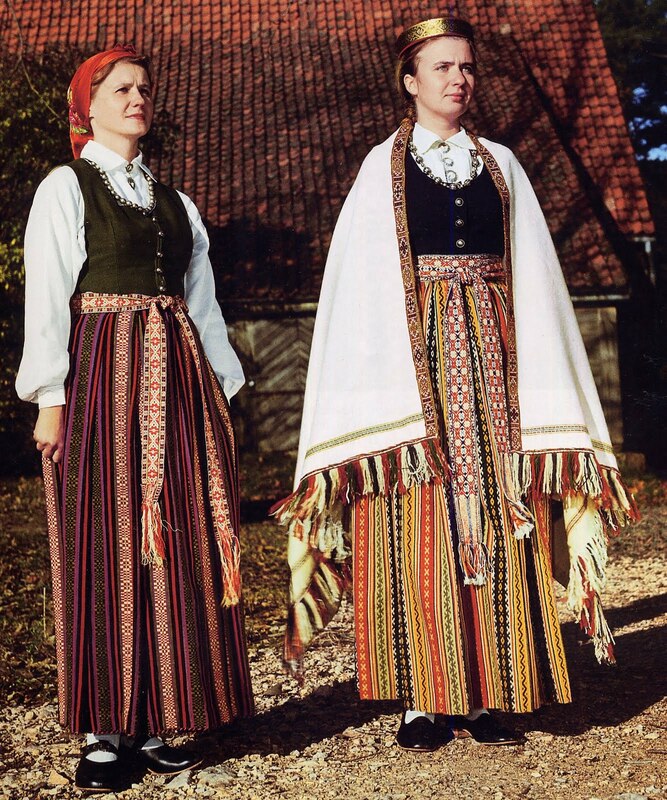 There does not seem to be much regional variety in the costumes of Semigalia [Zemgale], but as a whole the costume of the province has some distinct features, although clearly typically Latvian. Here is a photo of a girl from Zalenieki, in Zemgale. 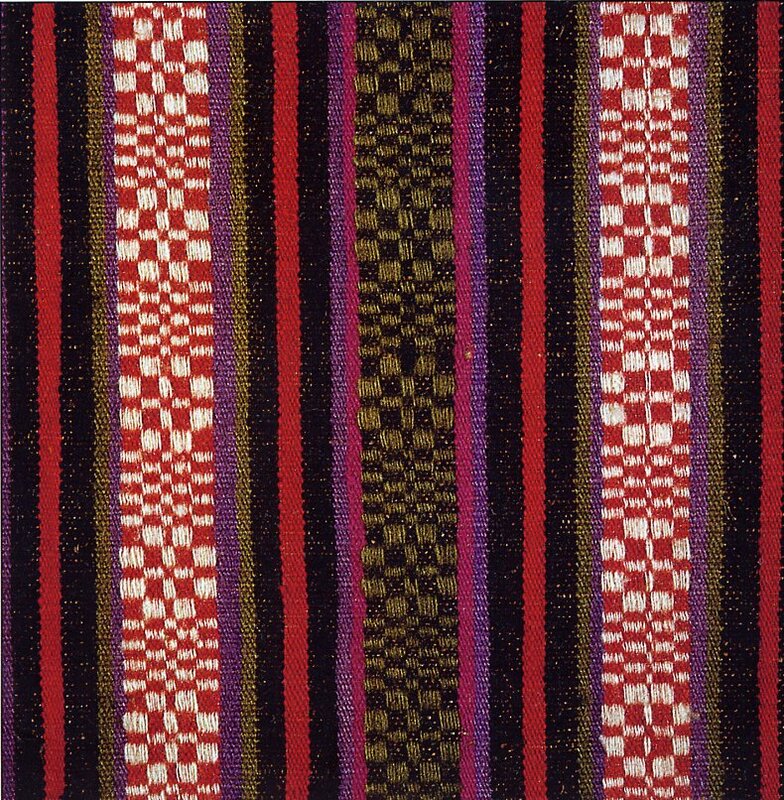 You will notice that the skirt is not woven in simple stripes, but rather some of the wide stripes have designs woven into them. This is one very distinct feature of this region, which had a very strong if short lived life as a center of the textile industry in the 19th cent. 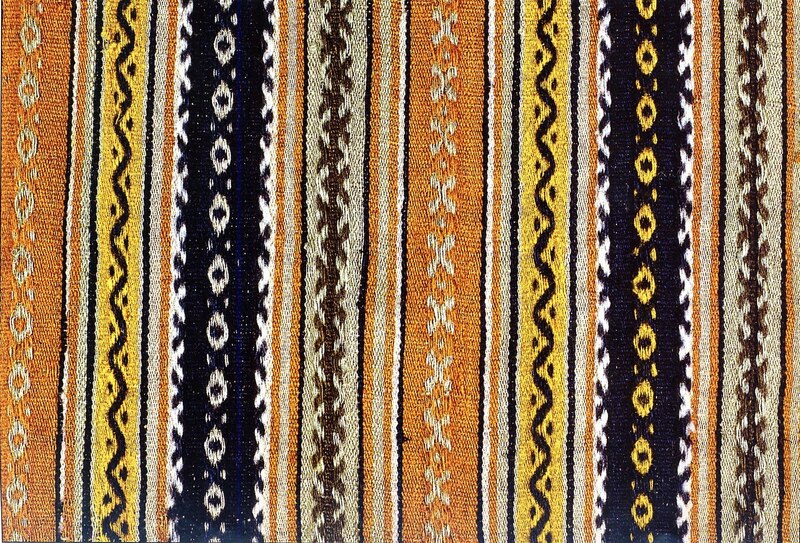 There are several other typical patterns woven into the skirts. This one is called 'roses'. 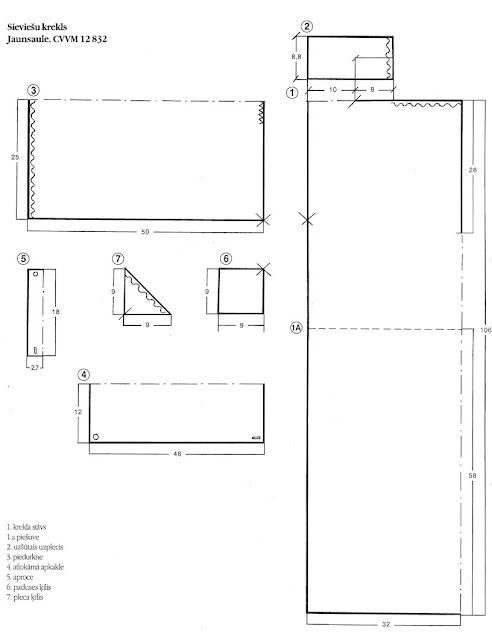 We will see other designs in other photos. 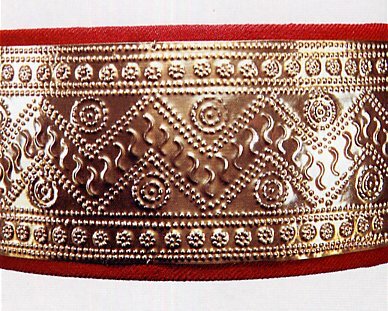 The Vainags, the maiden's crown is cylindrical and formed of embossed metal. 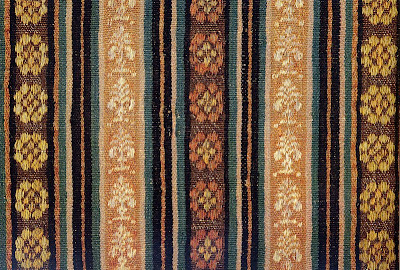 The Villaine, the wrap ends in long fringes in various colors, and the main ornamentation is not on the short ends, but on the long ends. They also do not resemble those of any of the regions we have yet looked at. 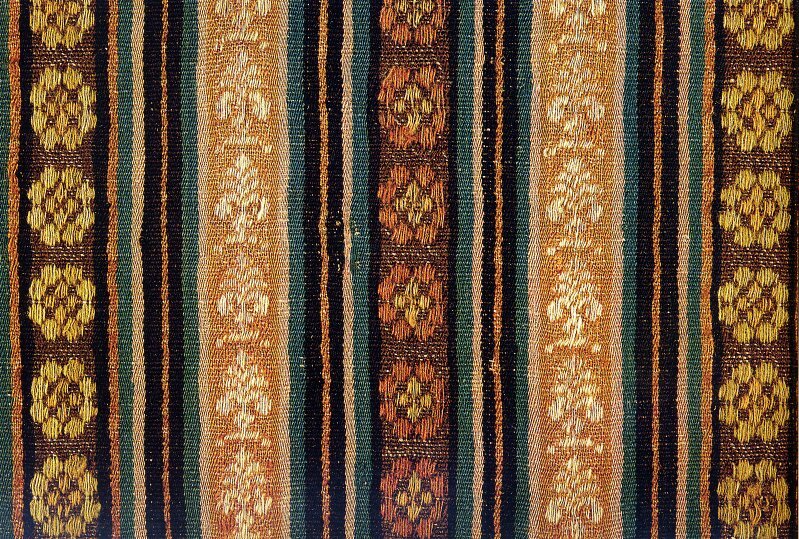 Here is a closeup of the Villaine.The narrow stripe on the bottom is woven in. 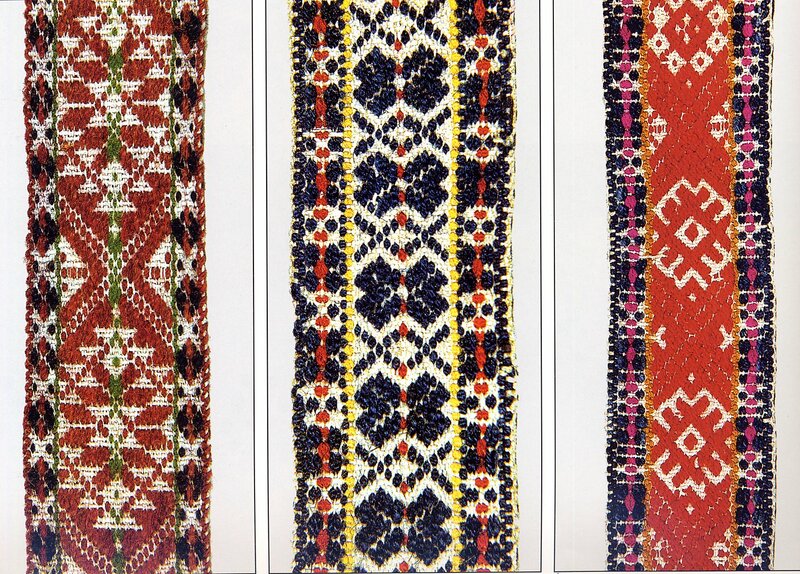 The larger ornament is a card-woven band sewn onto the edge. A closer look at the motifs on the card woven band. 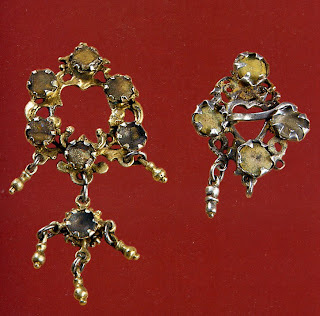 In Zemgale, the Vainags, the maiden's crown had disappeared by the mid 19th cent, being replaced by a head kerchief for unmarried women, and a myrtle crown for brides. 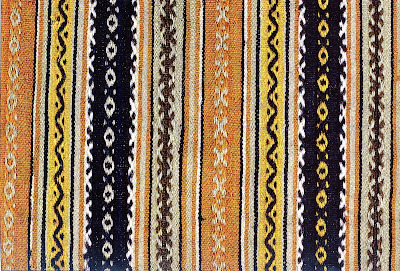 The kind shown in the photo, which is often worn with the costume today are replicas of Vainags from the 16th-17th cent. Here is a closer look at the one she is wearing. The sash, the Josta, in this region had two seperate designs in three bands, two narrower ones on the edges, and a wider one in the center. Here are a few examples. Compare these to the various photos in this posting. Here is a second photo; of a woman from Eleja and a girl from Bauska. You will notice that both repesent the same basic costume. Note the patterns on the sashes, and on the girl, the Villaine [wrap] and the Vainags [crown] are similar to that of the girl in the first photo. 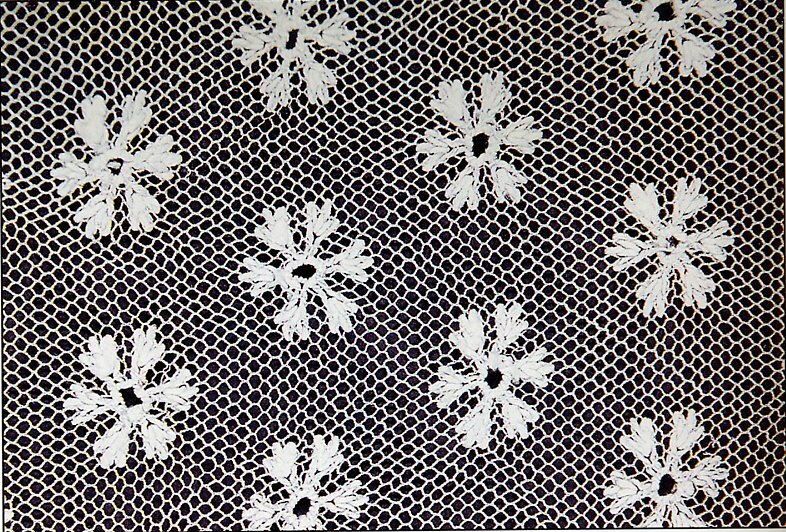 Here is a closeup of the 'cats paw' design of the first skirt. And of the second skirt. 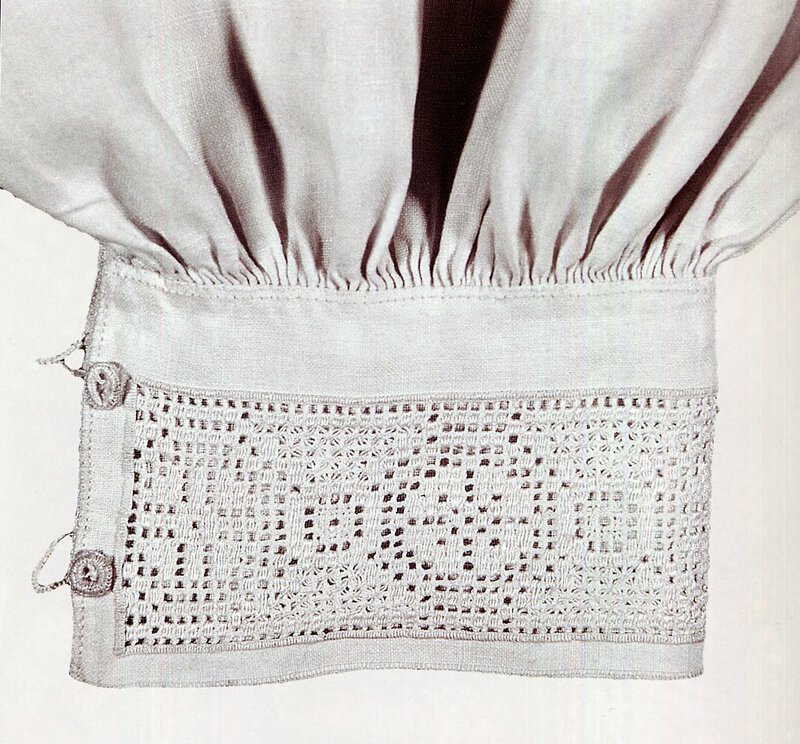 This photo also shows another piece typical of the costume, the short round necked bodice. The bodice today is made of plain colored wool usually in black, blue or green, but brocade examples are known from museum collections. Sometimes sleeves were added, to make a jacket. As in these two photos below. 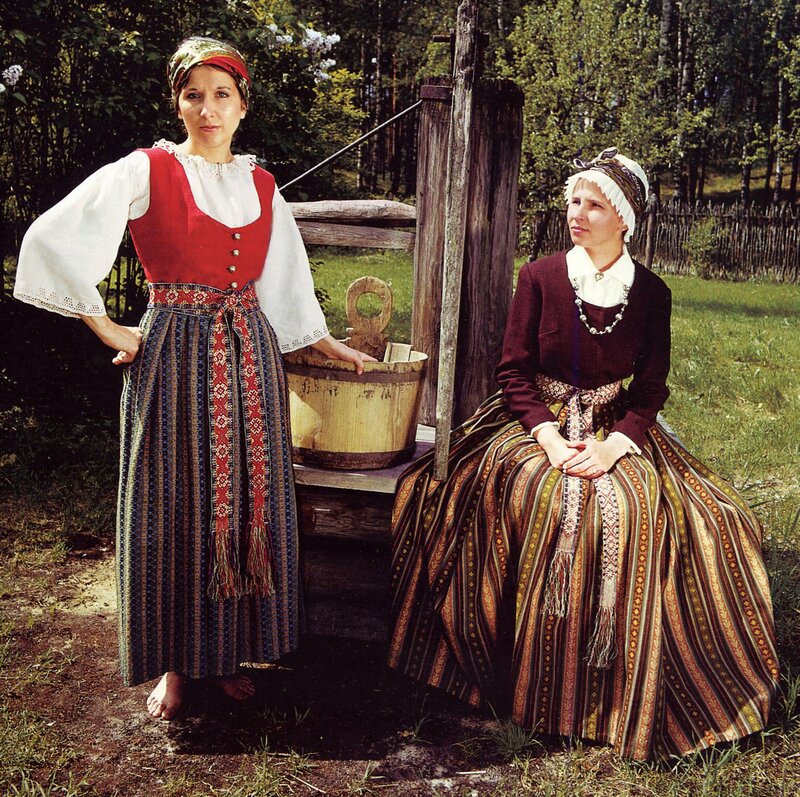 Here are two women from Zalenieki. 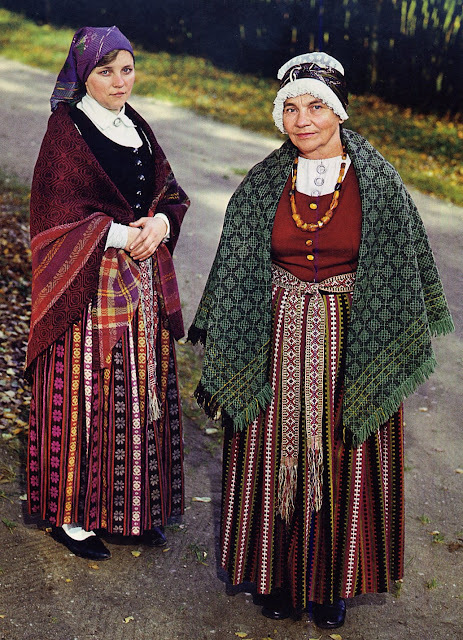 The woman on the right is wearing a skirt woven in another variant of the rose design. This woman is wearing a skirt with a design known from Gluda and Zalenieki. 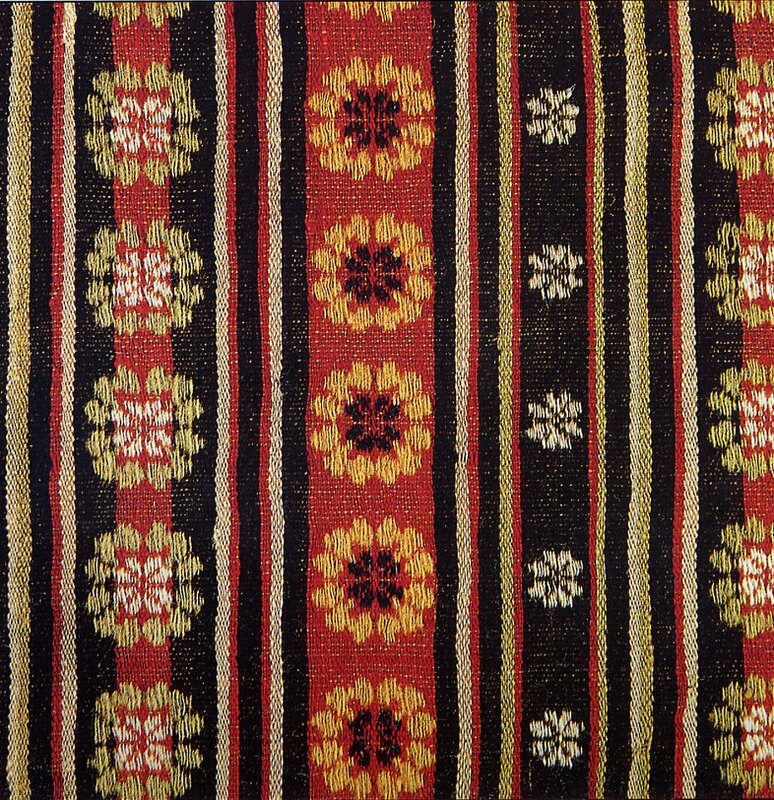 The plaid with floating woven design is reminiscnent of those in Dzukia, in Southeastern Lithuania, but i doubt that there is a direct connection. In both of the above two examples we see the married woman's cap. 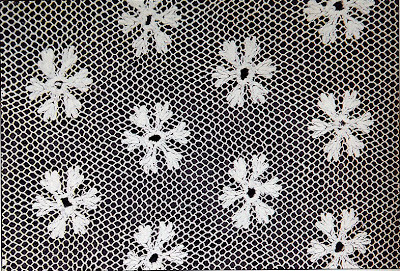 This has a round top made of embroidered tulle, and a frilled edge. 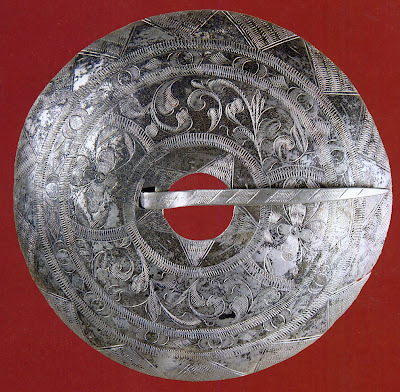 This cap was common in the 17th century from England to Belgium, France, north Poland, and as we can see, Latvia. 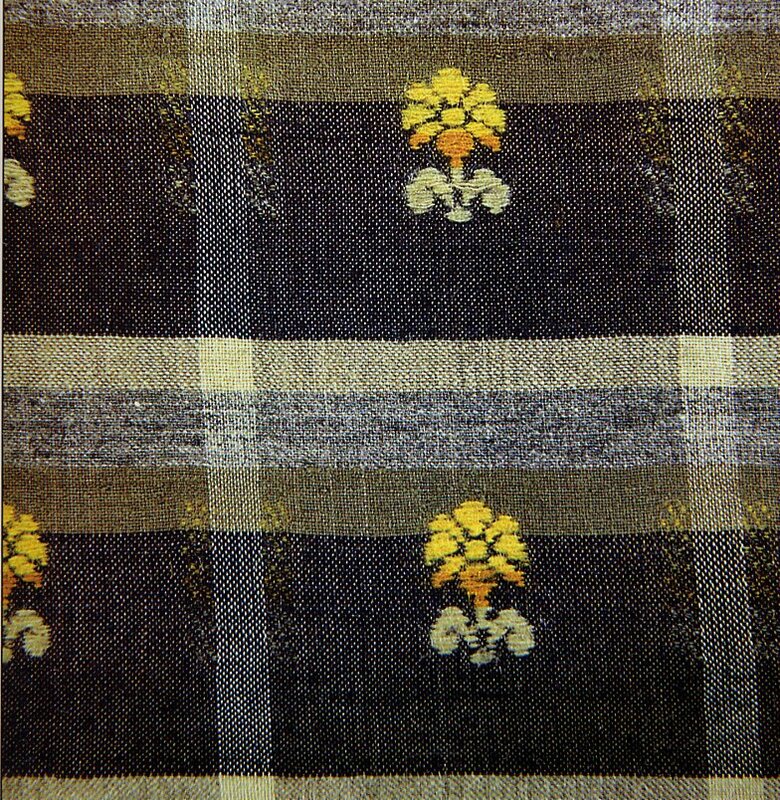 A silk scarf is folded and then tied around the head on top of the cap. Im sure that there was variety in the embroidery on the tulle. 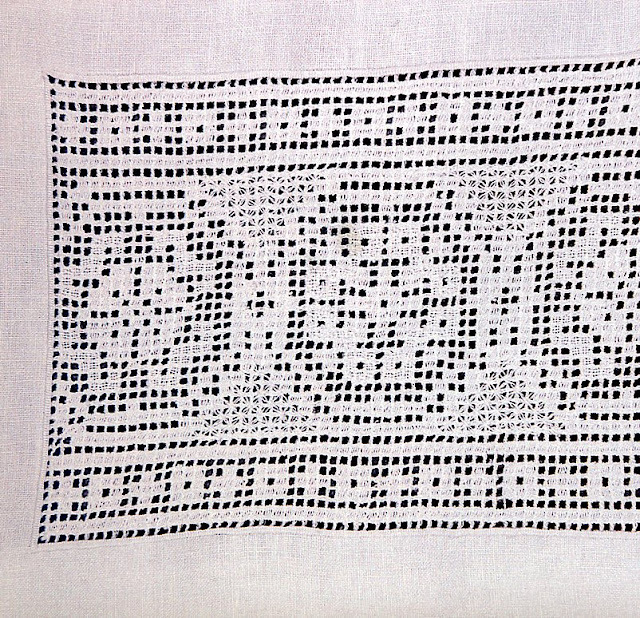 Shawls with patterned designs woven in were worn in this region. 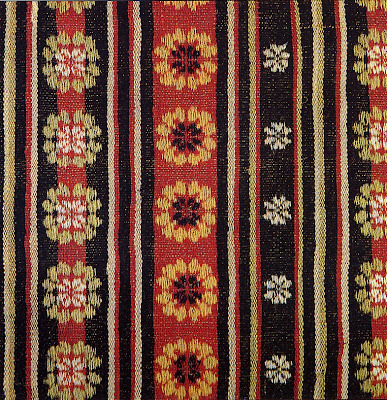 This type of woven pattern is also known from Lithuania and Belarus. 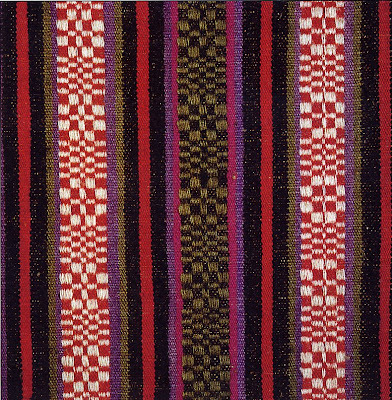 And again, you can see yet more designs woven into the skirts. I have yet to talk about the chemise. 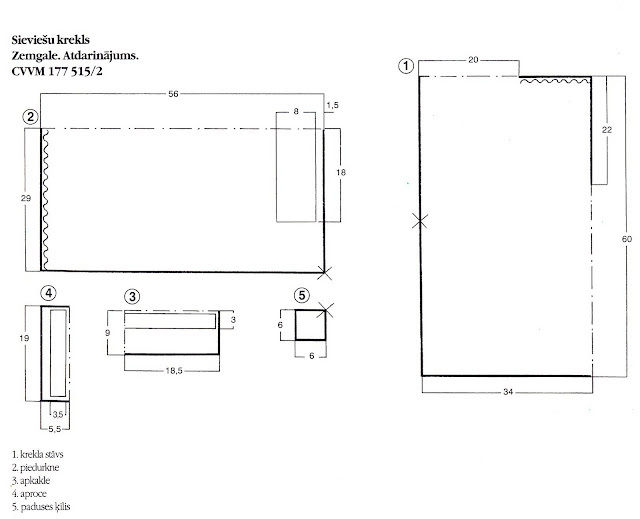 There are several cuts used, but they are generally variations on the ones we have seen before in Latvia. Here is a typical one. 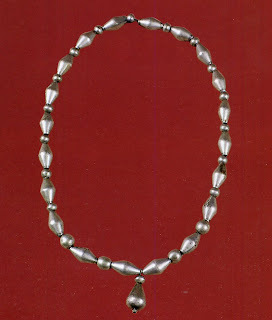 This one has a rather narrow shoulder inset, which is stlit, and then a triangular piece is set in to round off the neck opening. 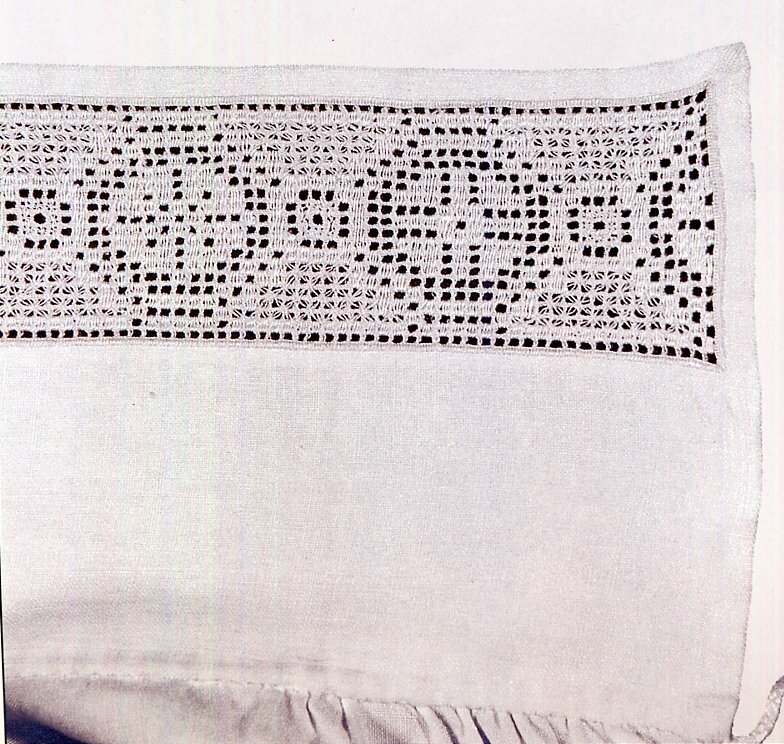 The chemises are often decorated with white hemstitching. These types of chemise were worn day to day. Festive chemises had a different cut, without a shoulder inset. They were, of course made of very fine linen. 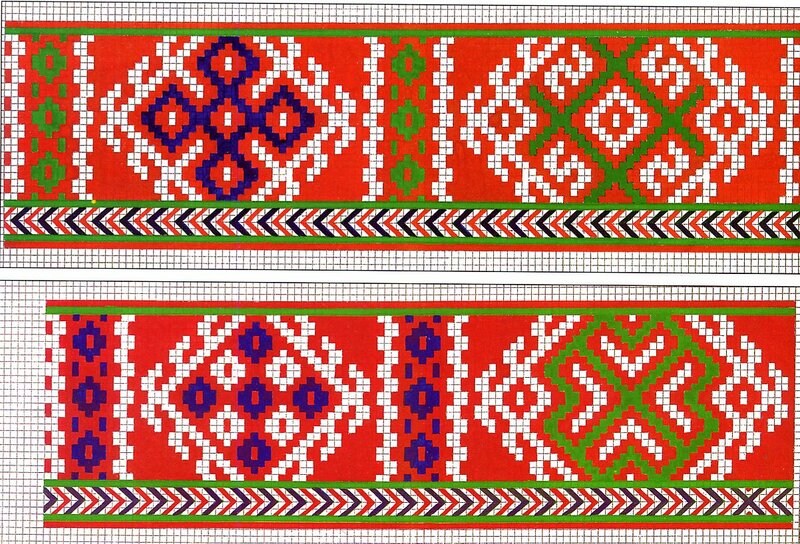 They were embroidered with two way drawn thread work, not too dissimilar to that done in northwest Russia, on the collar, cuff, and upper sleeve. 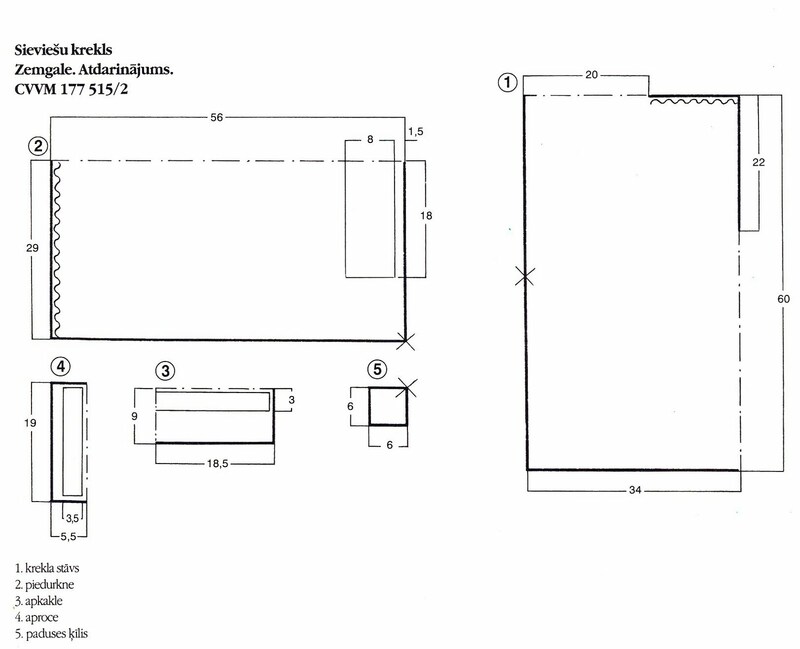 the embroidery fields are indicated on the diagram above. Here are closeups of one such chemise. Collar. 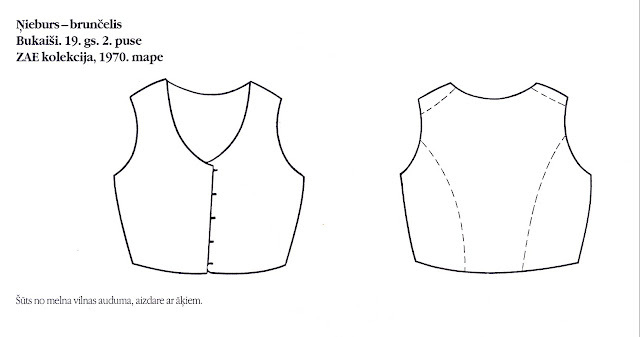 And upper sleeve, just below the seam with the body pieces. 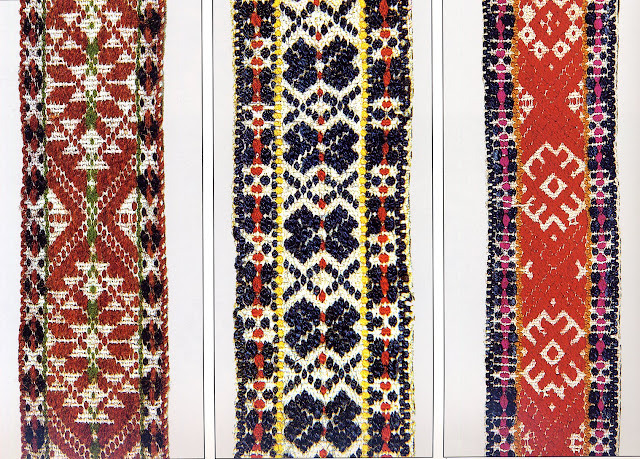 Chemises and shirts were pinned shut by the typical round pins used in other parts of Latvia, but also by neckpins which were more elaborate. Some seem to reflect Swedish influence. The large bubble brooches were worn here, as in other parts of Latvia, as you can see from the first photo, but they also used flat brooches with engraved designs, which were just as big. If you look carefully at the women above, you will notice that several of them are wearing necklaces consisting of hollow silver beads. This is not typical of Latvia, and they are not worn in the other provinces. 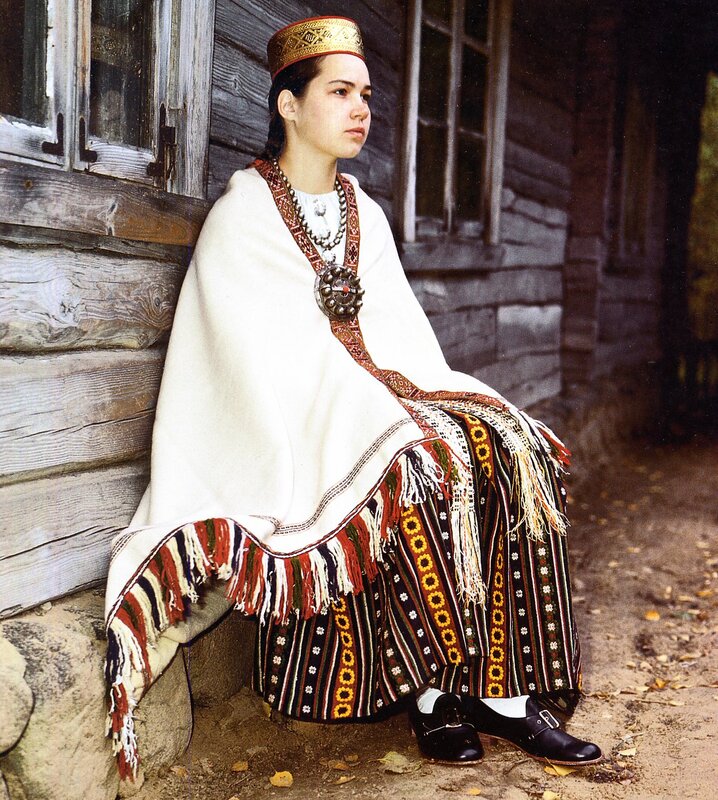 They are, however, typical of the Finnic peoples, and this custom is generally taken to be due to the assimilated Votic portion of the ancestral population. The beads can be round, oval, or walnut shaped. 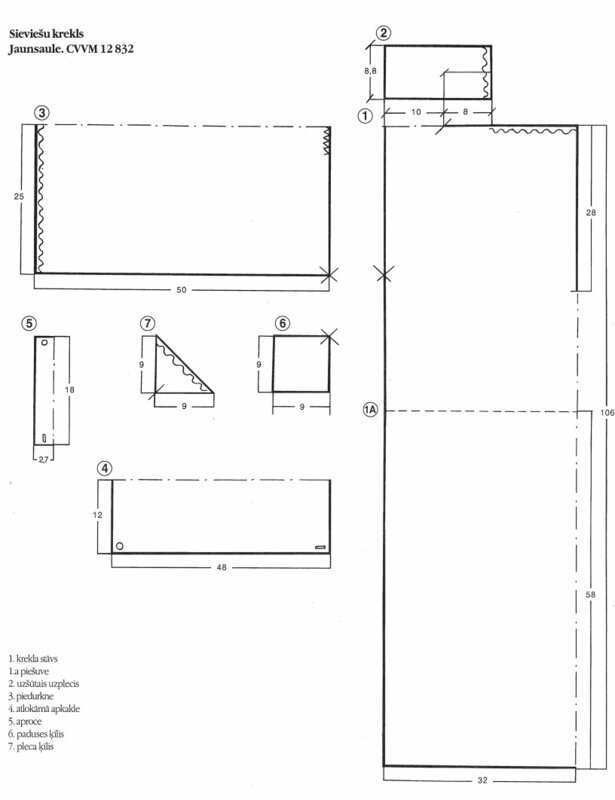 Thank you very much for reading. I hope that you have found this interesting or inspiring. Perhaps some of you will attempt the drawn thread work on a shirt of your own. Thank you for your repy!! Again, my compliments for the beautiful web site! 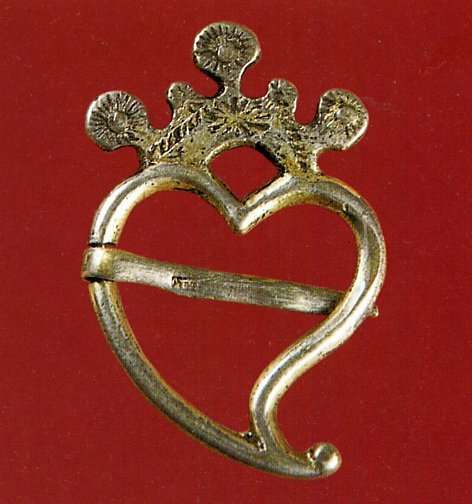 The neck pin shaped like a heart with a crown is very similar to a Luckenbooth brooch, which is a Scottish heart-shaped brooch. 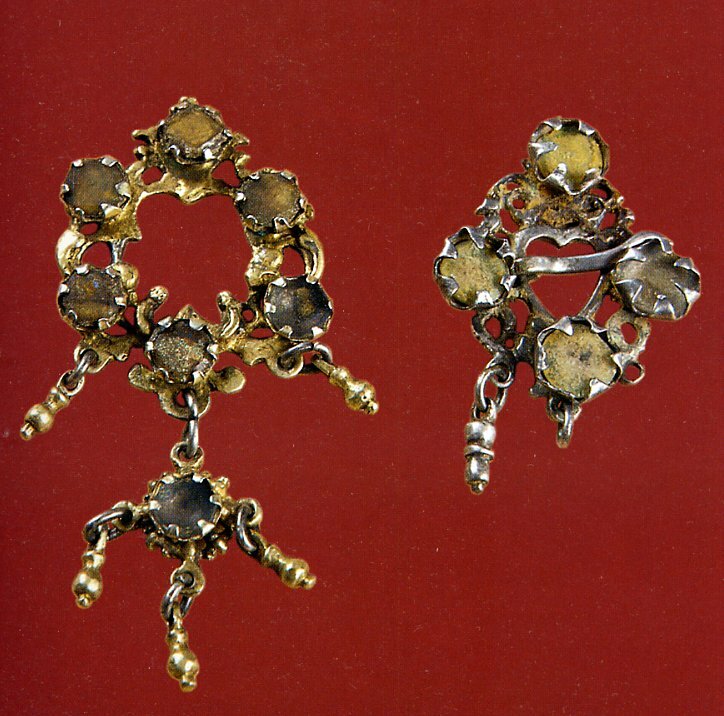 These brooches often have a crown above one heart, or two intertwined hearts. 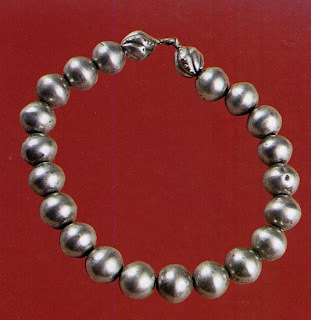 They are typically made of silver and may be engraved or set with stones. It is a traditional Scottish love token, often given as a betrothal or wedding brooch. It probably appeared in Scotland in the 17th century. 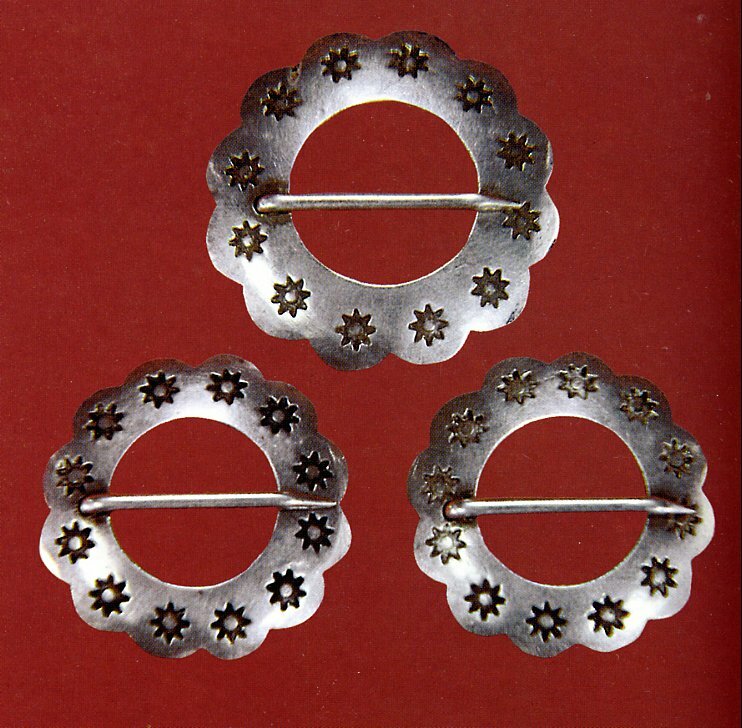 If you use Google Images, put in Luckenbooth brooch and you will see many wonderful examples.